- Volume 1, no. 1 (October 24, 1942)-vol. IV, no. 31 (July 28, 1945). - Editor: Oct. 24, 1942-Oct. 16, 1943, W. Hosakawa.--Oct. 23, 1943-May 5, 1945, H. Imura. - Published in Heart Mountain, <1943>-July 1945. - Also issued on microfilm from the Library of Congress, Photoduplication Service. 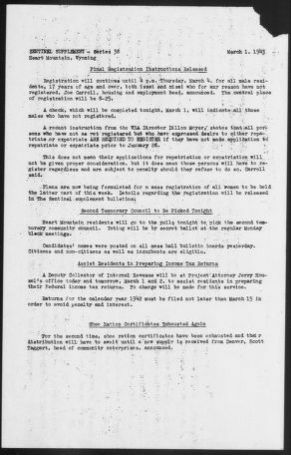 - Has supplement listing rules, regulations and procedures of the Relocation Center: Heart Mountain sentinel bulletin. - Japanese ed. : Hāto Maunten senchineru. - Abstracted in: Virginia journal and Alexandria advertiser [abstracts]. Heart Mountain sentinel . Cody, Wyoming, March 1. (Heart Mountain, WY), Mar. 1 1943. https://0-www.loc.gov.oasys.lib.oxy.edu/item/sn84024756/1943-03-01/ed-1/. (1943, March 1) Heart Mountain sentinel . Cody, Wyoming, March 1. Retrieved from the Library of Congress, https://0-www.loc.gov.oasys.lib.oxy.edu/item/sn84024756/1943-03-01/ed-1/. Heart Mountain sentinel . Cody, Wyoming, March 1. (Heart Mountain, WY) 1 Mar. 1943. Retrieved from the Library of Congress, www.loc.gov/item/sn84024756/1943-03-01/ed-1/. T.D. Kelsey's 1997 bronze sculpture of a bull elk, "Testing the Air," at the Buffalo Bill ... 1 photograph : digital, tiff file, color.